ACCST 2.4GHz system, provides high interference rejection even in interference rich environments. 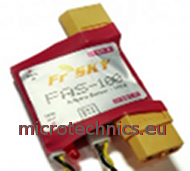 LAST FIRMWARE 2.1 : OK for FAS-100 and FAS-40 ! LAST VERSION NO UPGRADING NECESSARY! 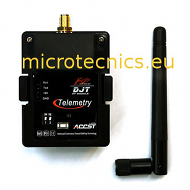 When connected to the D8R, D8R-V2, D8R-II, D8R-II Plus or D4R-II telemetry receiver, this hub will format and transmit all datas coming from connected sensors. 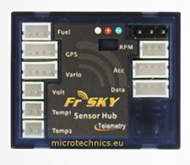 Inputs:2x Temperature, RPM, Altitude, Fuel gauge, GPS,LiPo Sensor, 3 axis accelerometer. 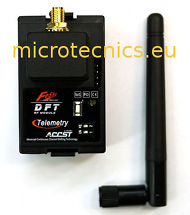 To be connected to D4R-II, D8R and D6FR telemetry receiver’s analog ports (A1 & A2). 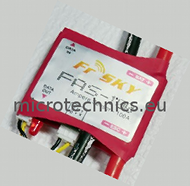 Has to be connected to the FrSky Sensor Hub (FSH). 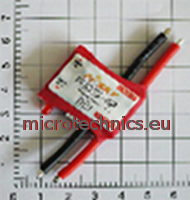 Up to two temperature sensors can be used at the same time. 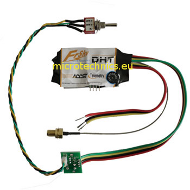 To be connected to FSH 'volt' port or directly to D4R-II, D8R, D8R V2, D8R-II, D8RII plus, D8RSP and D8RXP telemetry receiver’s data port ( Gnd-Tx-Rx) .